Quick and delicious is the best way to describe this recipe. That’s why I love stuffed peppers. They can be completely assembled and stored in the fridge in advance, so when you are ready, all you have to do is bake it. Also if you are carb-o-phobe using a pepper as your outer shell saves calories and adds on nutrients and flavor. Be creative with filling ideas, using beans, lentils, chick peas, brown or wild rice and different herbs and spices. Cut the top of the peppers and discard membrane and seeds. Reserve the top for later. In a large skillet, heat oil over medium-high heat. Add onion and cook for 4-5 min, stirring occasionally. Add carrots, beets, spinach and parsley. Let spinach wilt then stir in cinnamon, cumin and cooked quinoa. Toss gently to combine. Add salt, pepper and cook 1 to 2 min more. Set aside to let filling cool until warm. 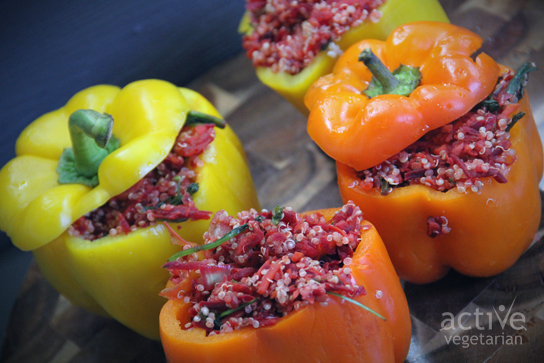 Divide quinoa mixture evenly among the 4 bell peppers. 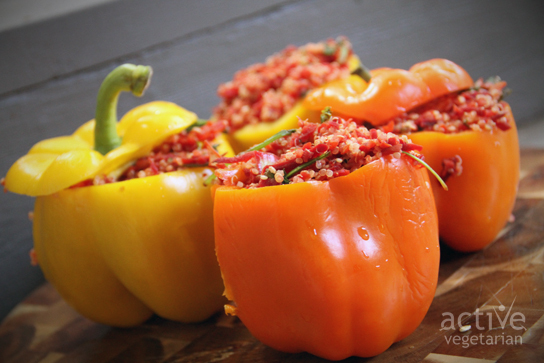 Finish each pepper with its reserved top then arrange them upright in a glass baking dish. Cover snugly with foil and bake for about 1 hour, checking halfway through, until peppers are tender and juicy .